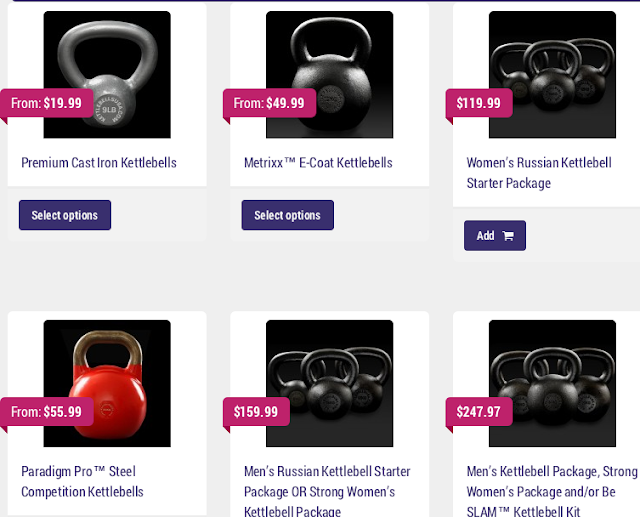 On The Edge Fitness KETTLEBELL STORE is Now Ready! Purchase any kettlebell or kettlebell package today and receive $5 off with on any or our results driven kettlebell DVDs and our effective Be SLAM (Be Strong Like A Mother) program! These kettlebells have been tested by all private members in my classes, training sessions and me. After spending 9 years trying and testing different types of kettlebells we have all come to an agreement that these kettlebells are the winner. You can view some of the packages I have put together for both men and female here. These classic Russian Kettlebells Metrixx series have a perfect shape that allows you to put your hand through to have the handle rest on the base of your hand without bending your wrist back. These bells are similar to the classic style bell that I began my kettlebell journey. The Metrixx coat kettlebells have a very nice non slip grip with a resilient finish. The main difference is the affordable price and perfectly flat handmachined flat bottom. These bells are made with single cast moldings wth superior consistency and quality. This size is the most popular starting weight for females new to kettlebell training. The majority of females do very well with starting with an 8kg bell. You will quickly move up to a heavier bell for swings and squats, but this bell will be your friend for a bit longer when performing exercises such as Cleans, Presses, Get Ups and High Pulls. This size is the perfect in between bell from a traditional starter 8kg to the next level 12kg kettlebell. This size is the most popular starting weight for stronger females newer to kettlebell training. The majority of females do very well with starting with an 8kg bell, but quickly begin swinging a 12kg. You will quickly move up to a heavier bell for swings and squats, but this bell will be your friend for a bit longer when performing exercises such as Cleans, Presses, Get Ups and High Pulls. This size is quickly becoming the most popular for stronger females that are ready to take kettlebell training to the next level. The perfect bell to help you get to the 16kg press or 16kg snatches that you've been going after! This size is the most popular starting weight for males new to kettlebell training. The majority of men do very well with starting with a 16kg bell. You will quickly move up to a heavier bell for swings and squats. About Competition Kettlebells. Great advantage of competition kettlebells is the handle size stays the same. Perfect for people with smaller hands. Perfect for doing push-ups on and renegage rows even for the 8kg bells. These classic Russian Kettlebells Metrixx series have a perfect shape that allows you to put your hand through to have the handle rest on the base of your hand without bending your wrist back. These bells are similar to the classic style bell that I began my kettlebell journey. The Metrixx coat kettlebells have a very nice non slip grip with a resilient finish. The main difference is the affordable price and perfectly flat handmachined flat bottom. These bells are made with single cast moldings with superior consistency and quality. Classic, Durable, Cast Iron Russian Kettlebells. “Gravity Cast” Molding With No Welds, Weak Spots, Seams or Burrs. Thick, Smooth, Handles Optimized to Prevent Chafing. “Machined” bases that are Perfectly Flat. Used by all branches of the United States Armed Forces, MLB, NFL, NHL and NBA. Good for many exercises such as halos and arm bars. Perfect starter bell for anyone who may be a little intimidated with starting their kettlebell journey. Small size bell and easy to manage. Perfect for rehab or pregnancy. Great practice bell for learning new exercises such as Get Ups. Beginner bell for anyone who may be a little intimidated with starting their kettlebell journey. Also great for learning exercises such as Get Ups, Cleans, Presses and Snatches. Small size bell and easy to manage. Perfect for rehab or pregnancy. Turkish Get Up - One of the best kettlebell exercises for your entire body! If you want to learn the beginning of a Turkish Get Up, grab your copy of The Kettlebell Body™ today.